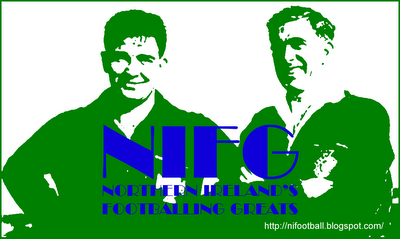 Representative Honours: Ireland: 3 Full Caps / 1 Goal (1922-1924); Irish League: 4 Caps (1922-1924). Club Honours: (with Queen’s Island) Irish League Champion 1923/24, Runner-Up 1922/23, 1924/25; Irish Cup Winner 1923/24; Co. Antrim Shield Winner 1923/24; City Cup Winner 1922/23, 1923/24, Runner-Up 1929/30; IFA Intermediate Cup Winner 1920/21; (with Glentoran) Charity Cup Runner-Up 1918/19; (with Fall River) American Soccer League Champion 1924/25, 1925/26; Lewis Cup Runner-Up 1925. Tommy "Tucker" Croft was an integral part of the Queen’s Island team who joined, then took the Irish League by storm in the early 1920s. Although an unrelated team of the same name had won the second ever Irish Cup competition, the Queen's Island that joined the Irish League in 1921, replacing the southern Irish clubs that had resigned, was a much younger side. From East Belfast, Croft played with a number of teams in that area, including Dundela. At the time he was still in the army and during leave he also took the opportunity to play with Belfast United. In 1918/19 he made five appearances for Glentoran and scored his first Glens goal against Cliftonville in a 3-0 Charity Cup semi-final win and played in the 1-0 Final defeat by Linfield. Having signed professional terms on 31st May 1919, Croft established himself in the firstteam for much of the 1919/20 season he bagged a hat-trick in a 7-0 City Cup win over Bohemians. After ten goals in 39 games for Glentoran, Croft signed for Queen's Island on the 6th November 1920. Queen’s Island, bolstered by a selection of players enticed by jobs in the shipyard, including Croft, finished as runners-up in only their second season in senior football, and in their third won the Irish League and Cup double, plus the Co. Antrim Shield and City Cup. A regular among the goals, Croft managed four in a Charity Cup game against Brantwood in May 1923. The 1924/25 season saw Queen's Island finish as League runners-up, but they did retain the City Cup, by which time Croft had left these shores behind. Described as "gritty and tenacious [he] gets through a wonderful amount of work ... knows when to hold on, to part, to break through and to shoot..." Croft won three caps for Ireland, all while with Queen's Island. He marked his only appearance in the International Championship with the winning goal against England. It was a game which adds much to his mystique, he arrived in the dressing room just twenty minutes prior to kick-off, whispering to a teammate, "I'm just after having four pints of porter." He then sustained "a rather serious injury" leaving doubts about whether he would be fit to restart after half-time. Still, he scored the winner, remarked on by teammate Jack Brown as "the best I ever saw". In the late 1924 Croft, unknown to his club or the Irish League, made a sensational move to the "big money" American Soccer League. The deal, concluded during a visit to Scotland for an inter-league game, earned him a suspension from British football, although he was in fact contracted to Queen's Island until 20th May 1926. 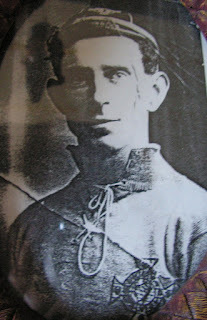 Between 1924 and 1926 he was with Fall River Marksmen and told the Weekly News: "I found I wasn't alone ... as far as United Kingdom footballers were concerned ... in fact, the entire team was composed English and Scottish players, one or two of whom had "jumped their contracts" with their clubs at home." He also revealed the other perks of soccer State-side, which included opportunities of a "good job" outside of playing. Having helped Fall River to successive ASL titles in 1925 and 1926 as well as scoring in their 1925 Lewis (League) Cup Final defeat by Boston, Croft left for J&P Coats of Pawtucket. It was noted that as "one of the best forwards that ever migrated to these shores" he was badly missed by Fall River. After spells with New York Nationals and Newark his appearances were on the wane and he decided to return to Ireland. On his return from America, Croft, once regarded as one of the biggest draws in the ASL, had to appeal to the Irish FA to be allowed to resume his Irish League career. He signed professional forms with Queen's Island on the 7th December 1928 - apparently all had been forgiven! Croft rejoined Queen's Island in what would be their final season in senior football. They were a shadow of the side he had left behind and finished bottom of the Irish League and were not re-elected. Glentoran were quick to step in to sign the cream of the Island's talent, picking up five of their former players – the pick of these was surely Croft. He had just one season at the Oval, earning praise for his performances on the left-wing, but failed to add to his medals collection, even missing that season’s Co. Antrim Shield final defeat by Linfield. 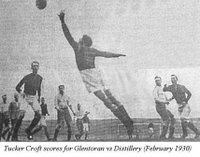 On leaving the Glens after just one season, Croft found himself without a club until he joined Glenavon on a month long trial on 18th October 1930 before he playing out the remainder of the season with Dundela. He then finished his career in Dublin with Drumcondra where he played most matches during the 1931/32 and 32/33 seasons, scoring a total of six goals, including one in a 3-1 Free State Cup win over Cork Bohemians on 27th December 1931. Summary: 3/1. Won 1, Drew 0, Lost 2. Additions and corrections by George Glass with further thanks to Jim Murphy. Photo courtesy of Tom Croft, Tucker's grandson. Tucker is also featured in the book "Belfast: Tears & Laughter: 1957-1977" by his grandson, Alan Croft. Would love to see or hear of any other info you might have Tom. I've already added bits and pieces based on what you've already told us, but could always do with a bit of beefing up. Tucker Croft also won the Intermediate Cup with Queen's Island in 1920/21, he scored the first goal as QI beat Forth River 2-0 at Solitude on St Patricks day.